Math-U-See is a complete, skill-based, multi-sensory mastery curriculum for grades K-12. Designed to teach students specific skills in a definite, logical sequence, this systematic and cumulative approach will help students learn how to solve math problems and discover why they’re solved in such a way. The Math-U-See system features step-by-step procedures for introducing, reviewing, practicing, and mastering concepts; each lesson includes a video, and many of the lessons from Primer through Algebra 1 use hands-on manipulatives. Teachers watch the video lesson to learn the new concept and how to demonstrate it; they then present the new concept to the student using the build-write-say model; finally, students practice the new concept using lesson practice problems from the student workbook. Student-paced, teachers are given clear guidelines for determining when students have achieved mastery and are ready to move to the next lesson or level. This Zeta Universal Set includes everything you need for the Zeta level, including the Instruction Manual, Instruction DVD, Student Workbook, Tests Booklet, Integer Block Kit, Algebra/Decimal Inserts, and 12 months of access to the Zeta Digital Pack. The Zeta level covers decimals and percents by extending the student’s concept of place value to the right of the decimal point. The connection between fractions and decimals is also presented and metric conversions are introduced. The Integer Block Kit includes 133 pieces, and is the only one you’ll need for all levels of Math-U-See, from Primer through Algebra 1; it includes 20 ones and tens, 13 fives, and 10 each of twos, threes, fours, sixes, sevens, eights, nines, and hundreds blocks, plus the Decimal Street/Block Clock poster. The Algebra/Decimal Inserts feature smooth pieces which snap into 10s and 100s blocks. This kit consists of four red 5” squares, two green 5” squares, 12 each of blue and gray .5” by 5” flat strips, and 20 .5” red cubes. The Instruction Manual features 30 lessons with detailed instructions that include illustrations of manipulatives and other visual modeling strategies. The back of the book contains line-listed answers to the student workbook and tests. The Student Workbook contains a number of worksheets for each lesson along with systematic review pages. Extra “Application & Enrichment” activity pages provide additional lesson practice through a range of age-appropriate activities. The Zeta Digital Pack includes an Instruction Manual PDF, lesson and test solutions, streaming instruction videos, access to the Math-U-See Digital Manipulatives, and other online resources. Instruction Manual, 230 pages, hardcover. Student Workbook, 434 perforated, three-hole punched pages, softcover. Non-reproducible; consumable workbook. Test Booklet, 80 perforated, three-hole-punched pages, softcover. Non-reproducible; consumable resource. Integer Block kit with 133-pieces in a cardboard storage box/carrying case. Algebra/Decimals Insert Kit with 50 pieces. 12 months of access to Zeta Digital Pack. Math-U-See is a complete, skill-based, multi-sensory mastery curriculum for grades K-12. Designed to teach students specific skills in a definite, logical sequence, this systematic and cumulative approach will help students learn how to solve math problems and discover why they're solved in such a way. This Zeta Level-Up Set is designed for customers who already own the Integer Block Kit (the manipulatives are integral to the program) and only need the instructional components and Algebra/Decimal inserts. This set includes the Instruction Manual, Instruction DVD, Student Workbook, Test Booklet, Algebra/Decimal inserts, and 12 months of access to the Zeta Digital Pack. The Zeta level covers decimals and percents by extending the student's concept of place value to the right of the decimal point. The connection between fractions and decimals is also presented and metric conversions are introduced. The Algebra/Decimal Inserts feature smooth pieces which snap into 10s and 100s blocks. This kit consists of four red 5" squares, two green 5" squares, 12 each of blue and gray .5" by 5" flat strips, and 20 .5" red cubes. The Student Workbook contains a number of worksheets for each lesson along with systematic review pages. Extra "Application & Enrichment" activity pages provide additional lesson practice through a range of age-appropriate activities. The Math-U-See system features step-by-step procedures for introducing, reviewing, practicing, and mastering concepts; each lesson includes a video, and many of the lessons from Primer through Algebra 1 use hands-on manipulatives (not-included). Teachers watch the video lesson to learn the new concept and how to demonstrate it; they then present the new concept to the student using the build-write-say model; finally, students practice the new concept using lesson practice problems from the student workbook. Student-paced, teachers are given clear guidelines for determining when students have achieved mastery and are ready to move to the next lesson or level. Student Workbook, 434 perforated, softcover. Non-reproducible; consumable workbook. Test Booklet, 80 perforated, softcover. Non-reproducible; consumable resource. This Zeta Base Set is designed for customers who already own the Integer Block Kit and Algebra/Decimal Inserts (the manipulatives are integral to the program) and only need the instructional components. This set includes the Instruction Manual, Instruction DVD, Student Workbook, Test Booklet, and 12 months of access to the Zeta Digital Pack. The Zeta level covers decimals and percents by extending the student's concept of place value to the right of the decimal point. The connection between fractions and decimals is also presented and metric conversions are introduced. 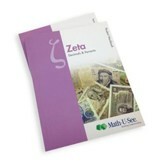 The Math-U-See Zeta Student Workbook contains a number of worksheets for each lesson along with systematic review pages. Extra "Application & Enrichment" activity pages provide additional lesson practice through a range of age-appropriate activities. The Tests Booklet provides opportunities for assessment with a test for each chapter, unit tests that cover multiple chapters, and a final test. This set of the individual workbook and test booklet is great for parents teaching multiple students, or for students taking a co-op class. It does not include any parent teaching material (test and student workbook answers are in the Instruction Manual) or manipulatives, which are necessary to use the program.